The Breakdown: What Is the True Cost of BP’s Oil Spill? As images of oil-drenched coastlines and stories of devastated industries and families flood the airwaves, how can we begin to reckon the real magnitude of the damage? It has been over a month since the Deepwater Horizon offshore oil rig crashed into the Gulf of Mexico, creating an oil spill of historic proportions. Each day since, thousands or even tens of thousands of barrels of oil have poured into the ocean. As images of oil-drenched coastlines and stories of devastated industries and families flood the airwaves, how can we begin to reckon the true cost of the spill—not just in oil but in terms of human value? The Nation's Washington, D.C. Editor Christopher Hayes and Boston College Law School Professor Zygmunt J. B. Plater try to answer that question on this week's edition of The Breakdown. It has been over a month since the Deepwater Horizon offshore oil rig crashed into the Gulf of Mexico, creating an oil spill of historic proportions. Each day since, thousands or even tens of thousands of barrels of oil have poured into the ocean. As images of oil-drenched coastlines and stories of devastated industries and families flood the airwaves, how can we begin to reckon the true cost of the spill—not just in oil but in terms of human value? The Nation‘s Washington, D.C. Editor Christopher Hayes and Boston College Law School Professor Zygmunt J. B. Plater try to answer that question on this week’s edition of The Breakdown. More about our guest, Zygmunt J. B. Plater. You may have noticed that we recently relaunched TheNation.com. 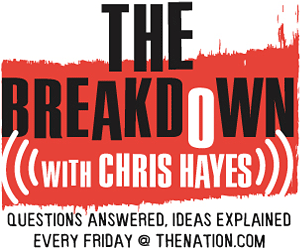 If for any reason you have not received this week’s Breakdown, please subscribe here.